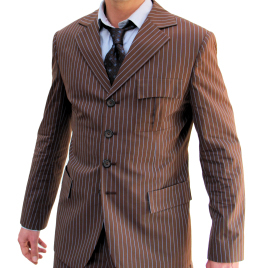 Today my Tennant Suit arrived. It was supposed to arrive Thursday so how happy was I went it showed up just after noon! I was so surprised to see the little box it came in, what was in side was far more surprising. The Blue with Red pinstripe suit!!!! I haven't seen anyone else order or review it, so I was interested in ordering it and seeing what all the fuss was about. I was not disappointed. The craftsmanship of the suit is impeccable. The suit jacket is a tad boxy, but I think it may be more to my faulty measurements than Indy's tailors. Luckily, it is better to have a more material to take in, than vice versa. But what REALLY impressed me was the pants. They fit like a dream and I think it is very difficult to find the right pants, but they are really the best part. The blue cotton is a little on the bright side, so I'll see what I can do on this end. But over all, I now fully understand why people are raving about Magnoli, I'll be saving up for the brown suit soon enough! Allons-y!